If you are going to be at NAMM 2018 then be sure to check out the Avid Main Stage program of events. You will be able to learn from the best at our daily sessions featuring Grammy Award-nominated and winning mixers and producers or get a behind-the-scenes perspective from the teams that bring you blockbuster film and television sound design. To mark the 40th anniversary of the Institute of Professional Sound, a number of celebratory events are to take place around the UK, in Belfast, Birmingham, Bristol, Cardiff, Glasgow and Salford. All will be on Wednesday, November 8th, 2017 between 19:00 to 22:00. We love attending Pro Audio Events, especially when great studio gear is on display in the company of great people. On the 11th October 2017, Pro Tools Expert attended an ADAM Audio S Series listening event, hosted by JigSaw24 and the ADAM Audio Team at Dean Street Studios - London. James Ivey & I attended. In this video for Pro Tools Expert, Technical Editor James Ivey reports at the end of Day 1 of a new music show from London's Excel Centre. BBC Introducing Amplify 17 is a proper music show for those who make and enjoy music. It is not just another tech trade show. Producer, song-writer, MPG Full Member CEO of Sociatech, and managing editor of the Production Expert family of sites, Russ Hughes is embarking on a new venture for the Music Producers Guild (MPG) - a base in Northern Ireland. The team at Jigsaw24 would like to invite you to the launch of the new ADAM Audio S Series speakers on Wednesday the 11th of October. Jigsaw24 will be joining ADAM Audio as they host an exclusive listening event at Dean St. Studios in Soho London, where they will be showcasing their groundbreaking S Series studio monitors. Friday 28th July 2016 saw the first Intelligent AV event at the Royal Institute of British Architects in London. Intelligent AV was designed to bring together suppliers, event managers, manufacturers and all those involved in the live event arena, from corporate events to stadium concerts and everything in between. Our friends at RSPE Audio Solutions invite you to join Grammy award-winning engineer Mick Guzauski (Daft Punk, Madonna, Michael Jackson, and way more) and Antelope Audio for an exclusive inside look at Orion32 HD and FPGA FX on Thursday 20th July 2017. There would appear to be no greater challenge than the one faced by attendees at the Kii Audio Three speaker listening event held at Red Bull Studios in London on the evening of Tuesday the 11th of July than "what shall we listen to next"? This event hosted at Red Bull Studios in London is an opportunity for producers and engineers to listen to the Kii THREE Professional studio monitors and you can bring some of your own reference audio tracks to get your own personal evaluation. 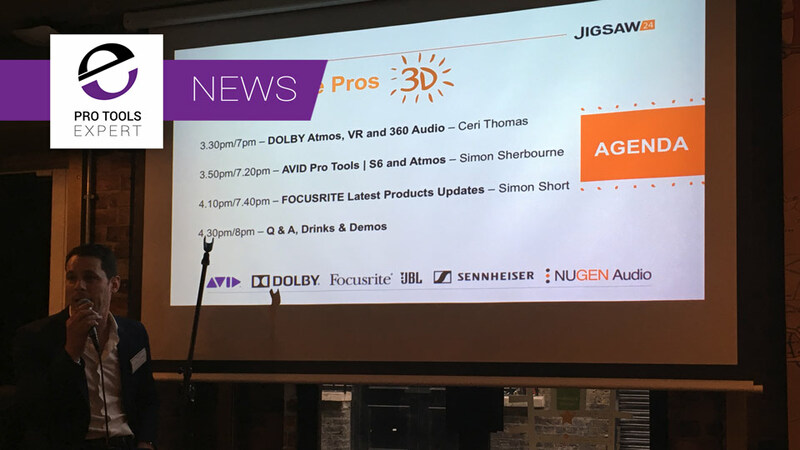 The event at Jigsaw 24's Soho base in Golden Square in London had a someone different line up from what was advertised but the underlying theme was unchanged - 3D audio for broadcast, film and VR. In this video from Musik Messe 2017 in Frankfurt Germany, Pro Tools Expert Technical Editor James Ivey talks to Marcel James about the new Antelope Goliath HD, the Zen Studio + and the Orion Studio -rev.2017.